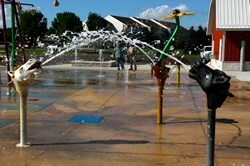 Wingra donated materials for the Fitchburg Splash Pad located in McKee Farms park. This wet and wonderful playground is fully accessible and safe for all ages and abilities. There are three zones: Toddler, with soft mists and gentle streams; Pre-teens, with high-energy, team-building activities; and Families, with dumping buckets, water tunnels and lots of good, clean fun. Wingra generously contributed time, material, and money to the Verona Little League which opened in 2006. The $1.7 million four-diamond complex includes lights, dugouts, outfield fencing, scoreboards, bleachers, batting cages, and a two-story concession area. The main field has a brick backstop wall resembling Wrigley Field in Chicago. It serves approximately 30 teams and 350 kids. The American Heart Association will help us save and improve people’s lives with research, education and emergency care. Wingra donated funds to help support this important cause. Their employees will participate in the 2016 Heart Association Heart Walk.